The 2019 Grammys was certainly a night to remember. We mean, Miley Cyrus and Shawn Mendes finally hit the stage together (talk about an epic duo! 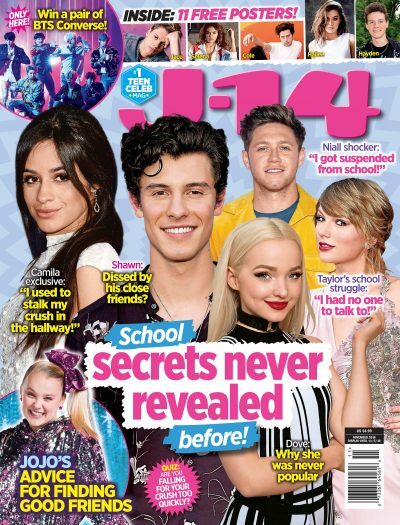 ), Camila Cabello slayed the stage when she opened the show singing “Havana” and BTS presented their first award in the U.S. Not to mention that a ton of our favorite stars took home awards — like Lady Gaga, Ariana Grande and Dua Lipa, for example — so yeah, it definitely did not disappoint! But one of the best parts of the star-studded night was probably seeing all of our fave celebrities together in the same room, right? We were lucky enough to catch a few of their epic interactions during the show. But what happened when the cameras were turned off? It turns out, there were a ton of adorable moments that went on behind-the-scenes, backstage and during commercial breaks! Lucky for you guys, we’ve got all the deets. Scroll through our gallery to see all the behind-the-scenes moments that weren’t on TV during the 2019 Grammys. Camila goofed off backstage with J Balvin and Ricky Martin, and it couldn’t have been cuter. BTS looked like they were enjoying themselves when they were caught during a commercial break! Miley was joined by her parents and her sister Noah Cyrus during the award show, and they looked like they were having a great time together. Her hubby Liam Hemsworth unfortunately didn’t attend due to an illness. How cute is this snap of Noah and Lady Gaga? Miley’s little sis was caught having the sweetest moment with the “Bad Romance” singer. Shawn and Katy Perry ran into each other backstage and since they’re two of our favorite stars, we obviously loved seeing them together! They even snapped a pic with Shawns mom, Karen Mendes. How cute is it that he brought his parents with him to the award show? Dua was caught getting a little emotional after she won the award for Best New Artist. Aww, we’re honestly so happy for her! Lady Gaga and Cardi B were snapped sharing a sweet moment in the audience. It couldn’t have been cuter. When Kelsea Ballerini and Alicia Keys ran into each other backstage, it was just magical.